Wat Pho in Bangkok, built in the 16th century by King Rama I on the site of an existing temple is the oldest and biggest Bangkok temple. 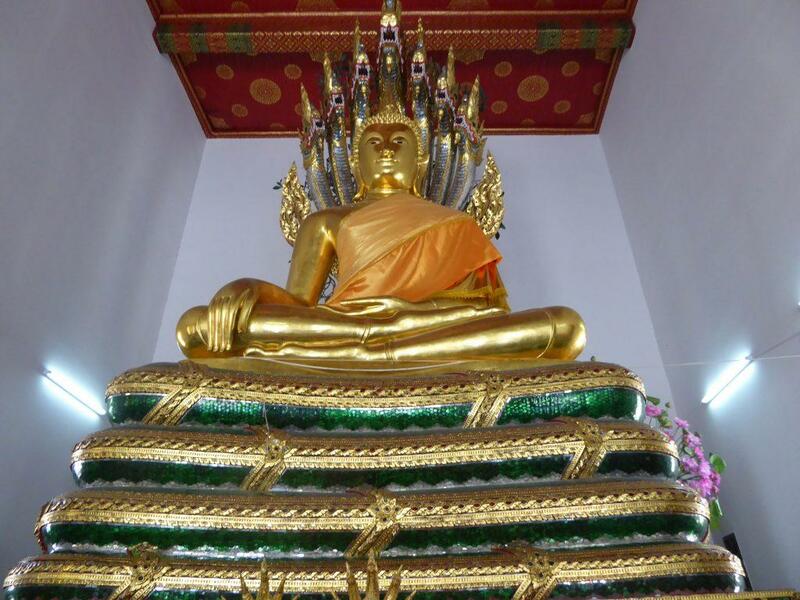 It is also known as the Temple of the Reclining Buddha and officially as Wat Pra Chetuphon. It’s a first-class royal temple and a significant cultural and historical site that is a resource for various types of knowledge such as arts, religion, medical studies, and literature. 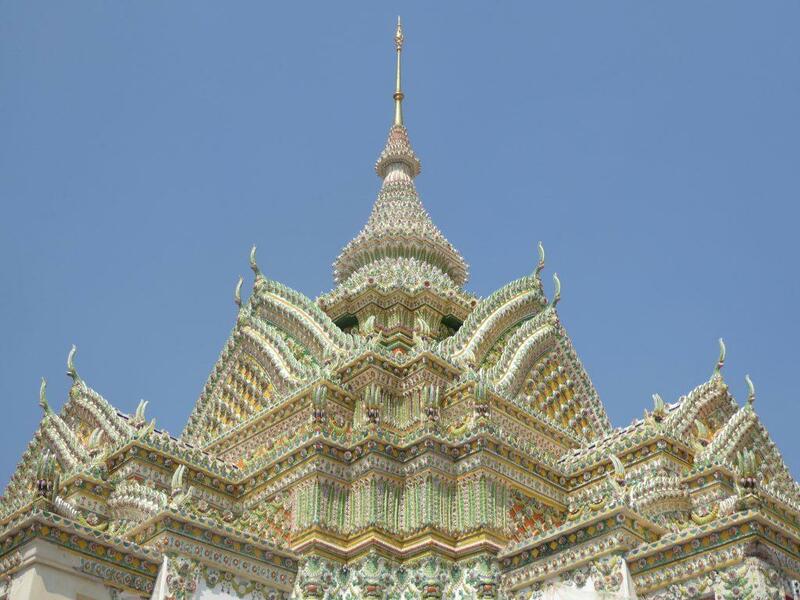 It is next to the Grand Palace and Wat Phra Kaew in the Rattanakosin district of Bangkok. 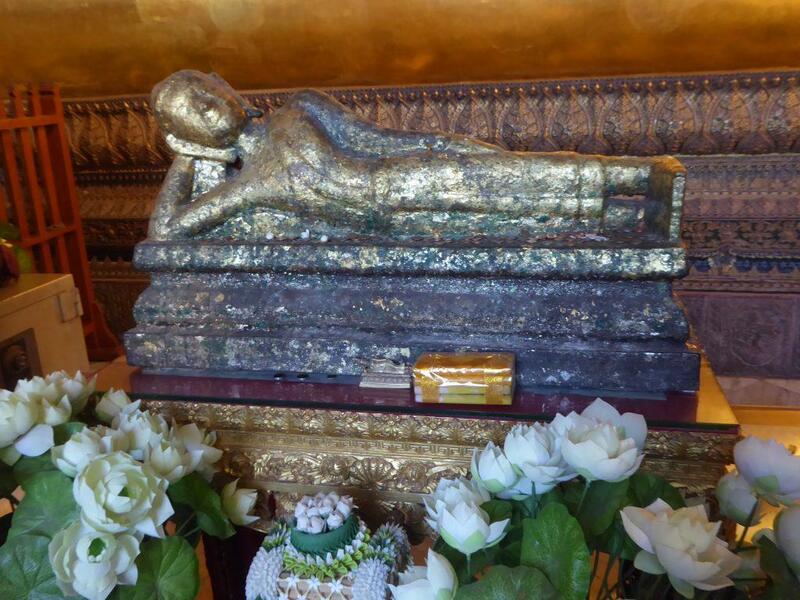 Wat Pho’s most famous feature is The Reclining Buddha which is one of Thailand’s largest Buddha images. The temple complex also houses the largest collection of Buddha images in Thailand. 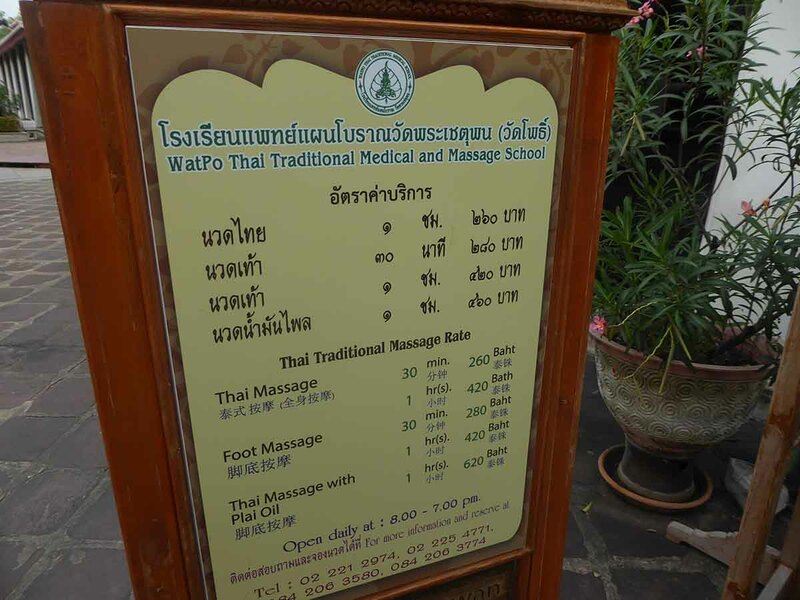 It is also the birthplace of traditional Thai massage and contains a traditional medical science school, a massage school and a pavilion where the public can receive a massage on payment of a fee. 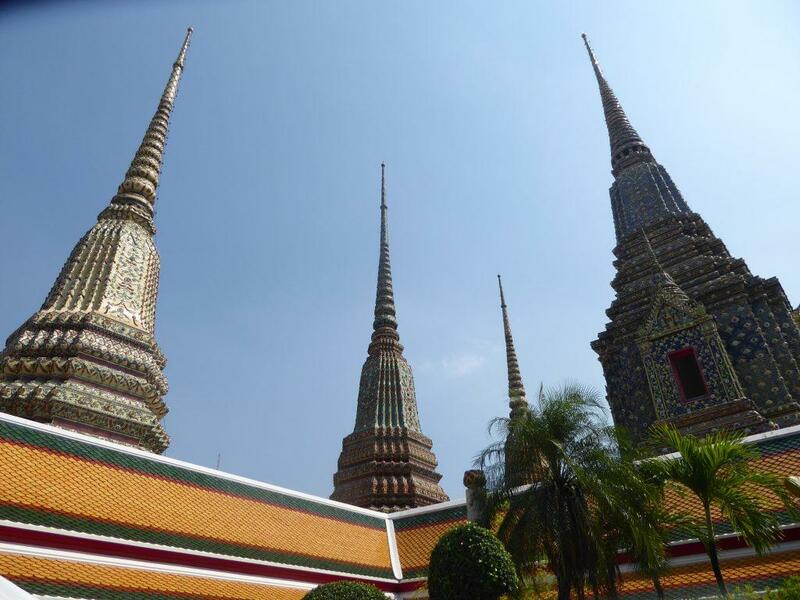 The Wat Pho complex consists of two walled compounds with a road separating them. The southern compound is a working Buddhist monastery and school while the northern compound contains the temple and massage school and is open to the public. Admission is 100 baht for foreigners and free for Thai citizens. 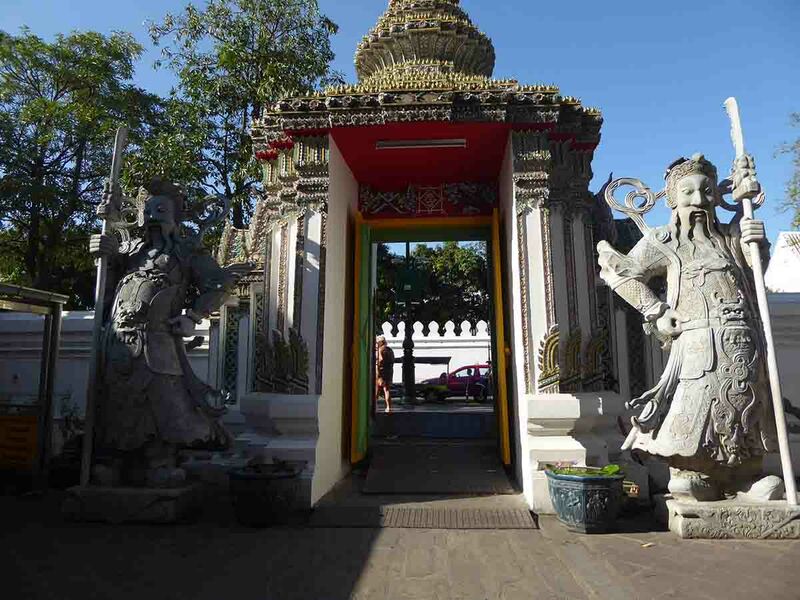 After entering you will find the Sala Rai Pavilion on your left containing information in English & Thai about the history of the temple, the temples Buddha images, statues, the temple buildings, Thai massage and more. The pavilion contains Buddha images, images of famous monks, paintings and works of art. On your right, as you leave the Sala Rai Pavilion is the Phra Buddha Saiyas Vihara which contains the temples most famous attraction, the Reclining Buddha. In 1832 Rama III built the Vihara to house the Reclining Buddha (Phra Buddha Saiyas) and decorated the walls and pillars with murals. The Reclining Buddha is 46 meters long, 15 meters tall, and the soles of the feet are 3 meters high and 4.5 meters long. The Buddha is in the Sihasaiyas posture, which means lying like a lion. 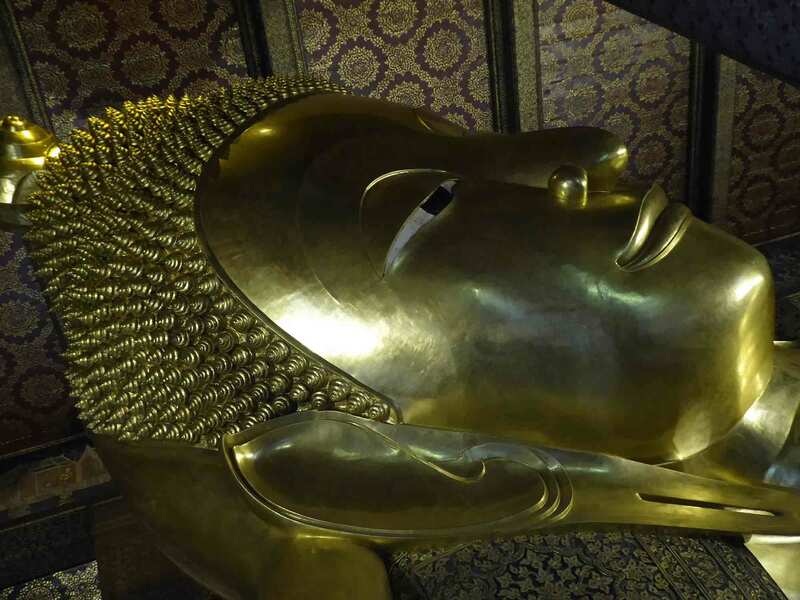 It is the largest reclining Buddha image in Bangkok and the third largest in Thailand. Gold leaf covers the image and the soles are inlaid with mother-of-pearl. They are each divided into 108 arranged panels, displaying auspicious symbols such as flowers, dancers, white elephants, and tigers. At the center of each foot is a circle representing an energy point. 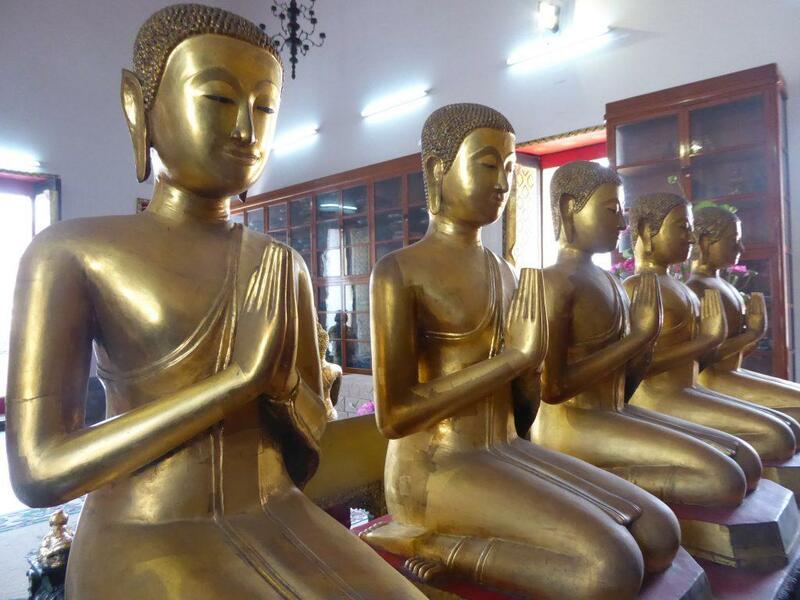 Each side of the Buddha there is 108 bronze bowls into which worshippers drop coins. They believe it will bring them good luck and long life. 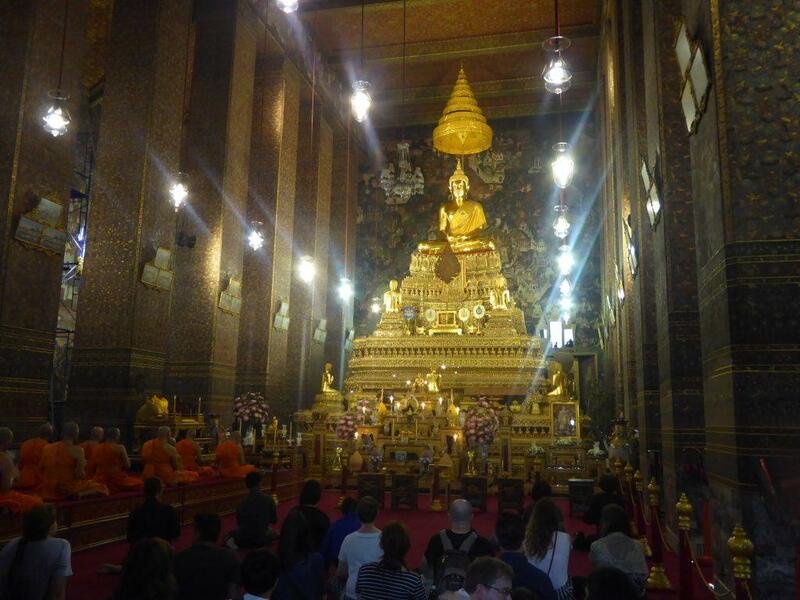 Worshippers pay homage to the Reclining Buddha with 9 incense sticks, a pair of red candles and 11 gold leaves. There are also other smaller Buddha images in the Viharn as well as some beautiful murals adorning the walls which date back to the reign of King Rama III. The murals on the interior wall illustrate the Buddhist tales of Ettadagga. Murals located above the doors & windows illustrate the story of Mahavong (the history of Buddhism). The murals on the secondary beam below the main roof beam illustrate the heaven at Tavatimsa & the battle between heavenly beings & demons. Murals on the outside doors & windows illustrate Thai ancient weapons. Outside the Viharn is a shady seating area with a fountain, the temples belltower and several statues as well as a shop dispensing free bottles of drinking water. At the side of the Viharn is a garden area Suan Misakawan which contains a Chinese style pavilion featuring murals depicting scenes from “Sam Kok” a famous Chinese literary work. In the center is an important Assattapreuk Tree which came to the temple from Sri Lanka in the reign of King Rama IV. At the edge of the park are a laughing Buddha image and a small shrine. 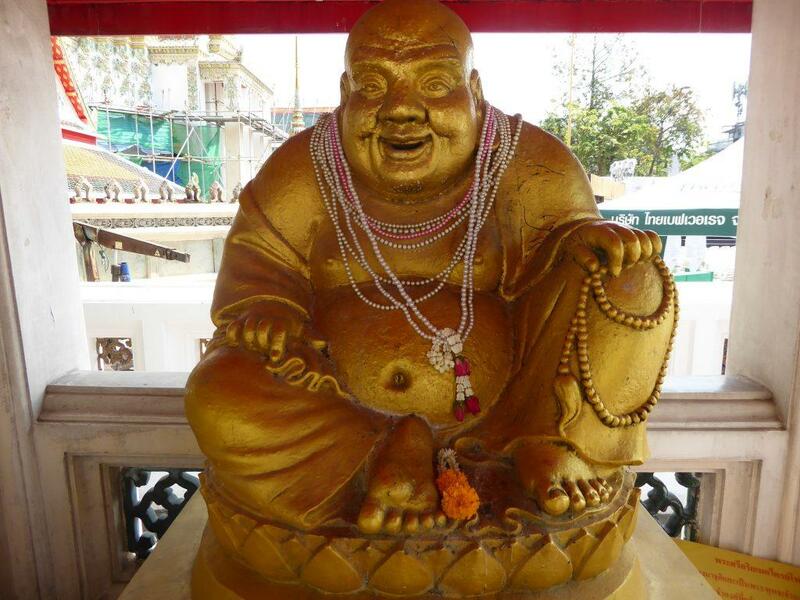 From the laughing Buddha, turn left and you will come to the Phra Mondop (Hor Tri Jaturamuk). Two Yaksha guardians man the main entrance. The Mondop built during the reign of King Rama III is a scripture hall containing Buddhist scriptures. The hall has a crowned gable roof decorated with multi-colored china and glazed mosaic tiles. Surrounding the Mondop are directional pavilions which contain murals depicting the stories from the Ramakien. They also contain Buddha images, Chinese & Benjarong porcelain & antique bookshelves. The guardians known as Yok Wat Pho are similar to the giants in the Ramakien and a pair guard all four gates to the Mondop. Next to the Mondop is a shady garden with seating, a fountain, banana trees, and the Crocodile Pond, though there are no crocodiles. 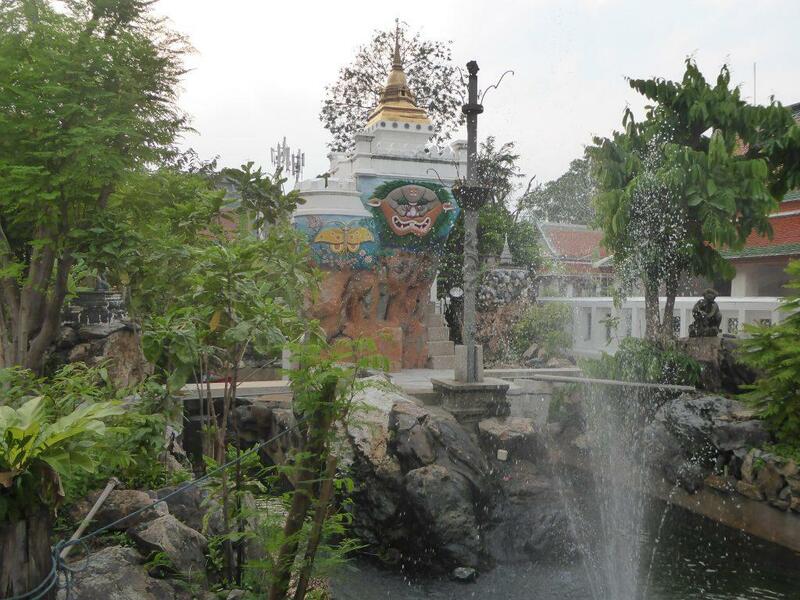 In the middle of the pond is an artificial hill decorated with murals with a staircase leading to a small golden chedi at the top. Behind the pond is a Chinese style building with a western roof known as “Tuek Farang”. In all the temple complex is home to over a thousand Buddha images many of which came from the ruins of the former ancient cities of Ayutthaya and Sukhothai. 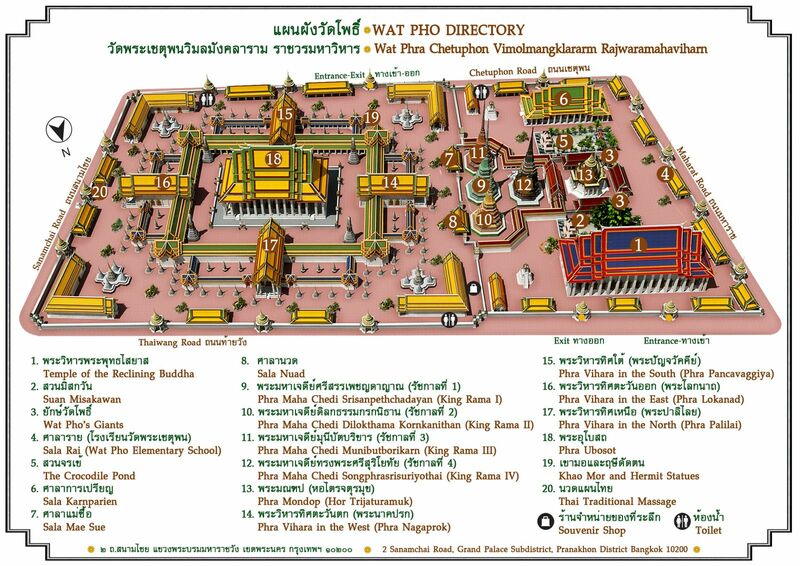 There are also images from Phitsanulok, Sri Satchanalai and images there were made at Wat Pho. The images date from many eras including Lanna, Chiang Saen, Sukhothai, early, mid and late Ayutthaya and the Rattanakosin period. 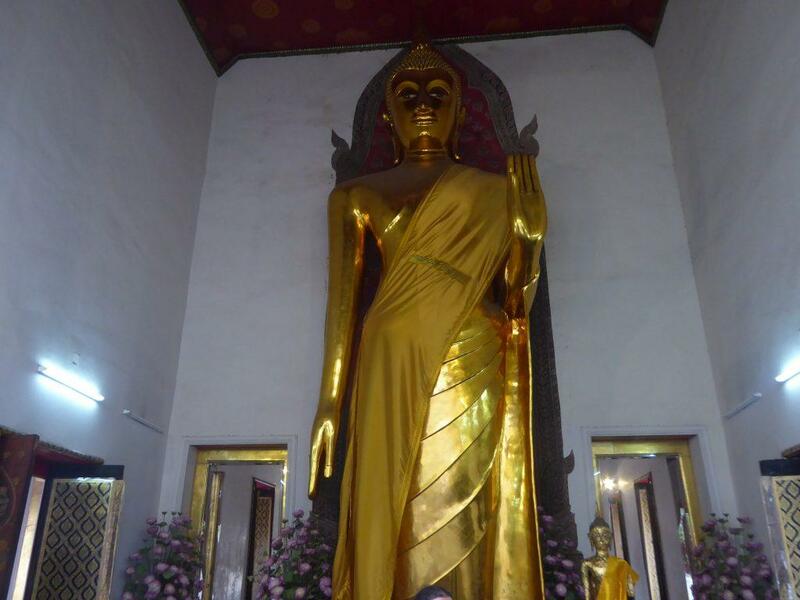 Many of the Buddha images are in two cloisters (Phra Rabieng) and line the inner walls. People believe that worshipping the Buddha images will bring luck to their life. Wat Pho has inner & outer cloisters. The inner cloister has 150 Buddha Images while the outer has 245. 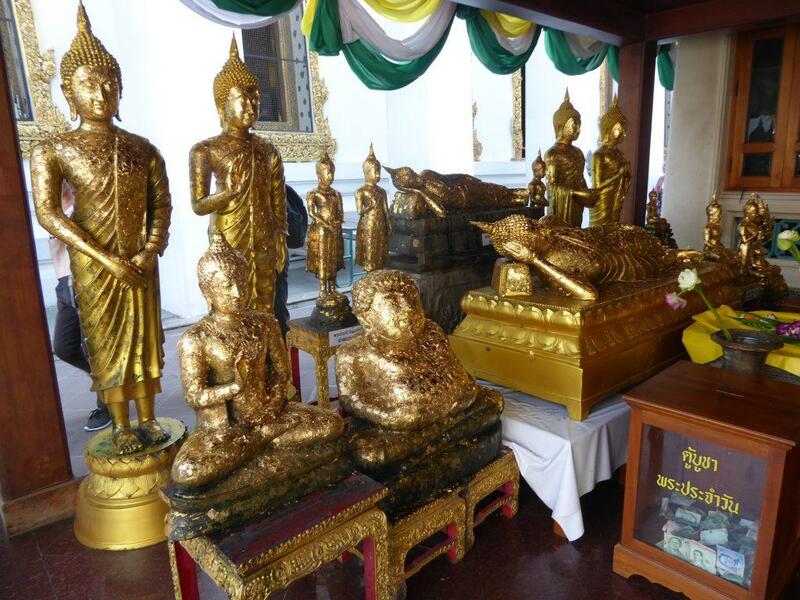 The images came from various old cities during the reign of King Rama I. They are all bronze and lacquered in black & gold. The cloisters surround the most important building in the temple, the Ubosot or Ordination hall. 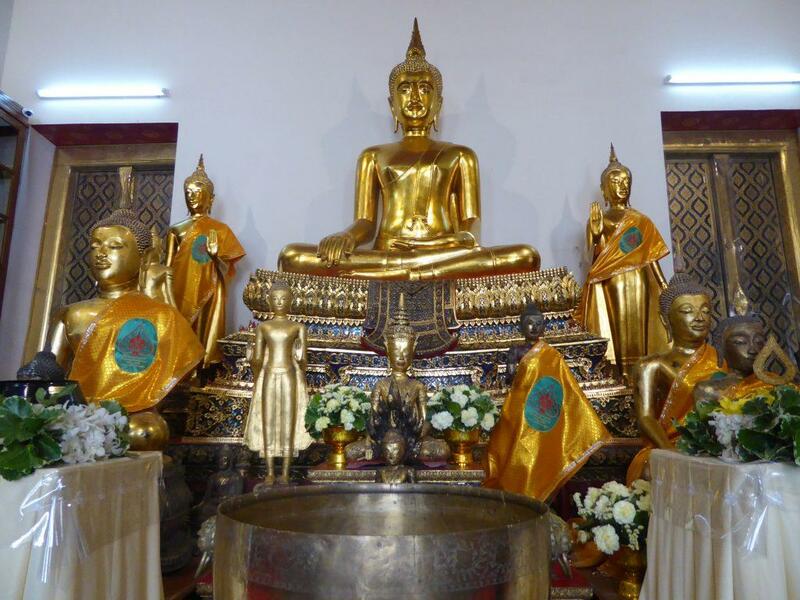 This is where religious rites take place and house the principal Buddha image. At Wat Pho, the principal image is an Ayutthaya period image, Phra Buddha Theva Patimakorn (an image crafted by an angel) in the posture of a seated Buddha. The Ordination Hall originates from the reign of King Rama I (the founder of Bangkok). Some of his remains are in the pedestal supporting the Buddha. The hall also contains 154 mural paintings depicting stories from the Ramakien. There are also four chapels (Viharns) with large golden Buddha images in the corners of the cloister. In the East Viharn is Phra Buddha Lokanatha an 8-meter-tall standing Sukhothai style Buddha that came to Wat Pho from Ayutthaya in 1789. Phra Buddha Chinnasri a seated Buddha sheltered by a 7-headed naga. 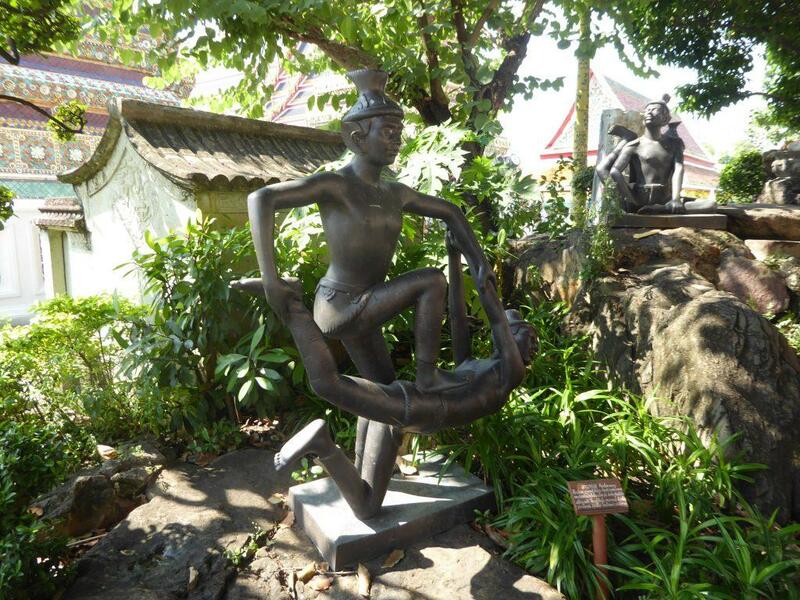 The image came from Lopburi by King Rama I and can be found in the West Viharn. 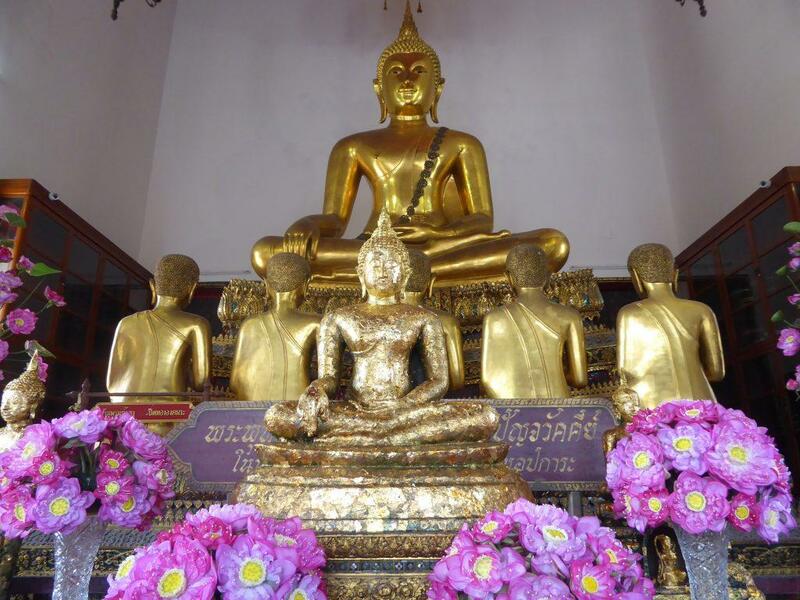 In the South Viharn is Phra Buddha Chinnaraja, a sitting Buddha giving a sermon to five disciples. 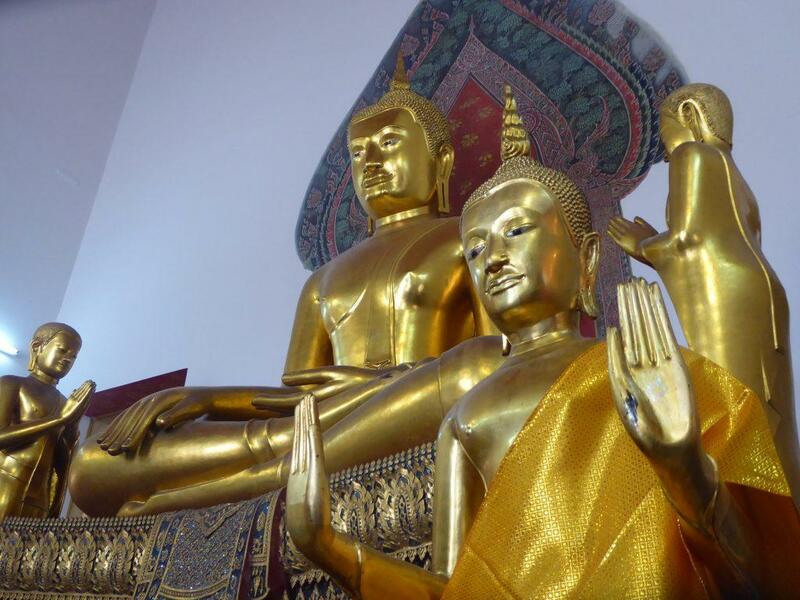 Buddha’s Chinnasri & Chinnaraj were both brought from Sukhothai by Rama I. 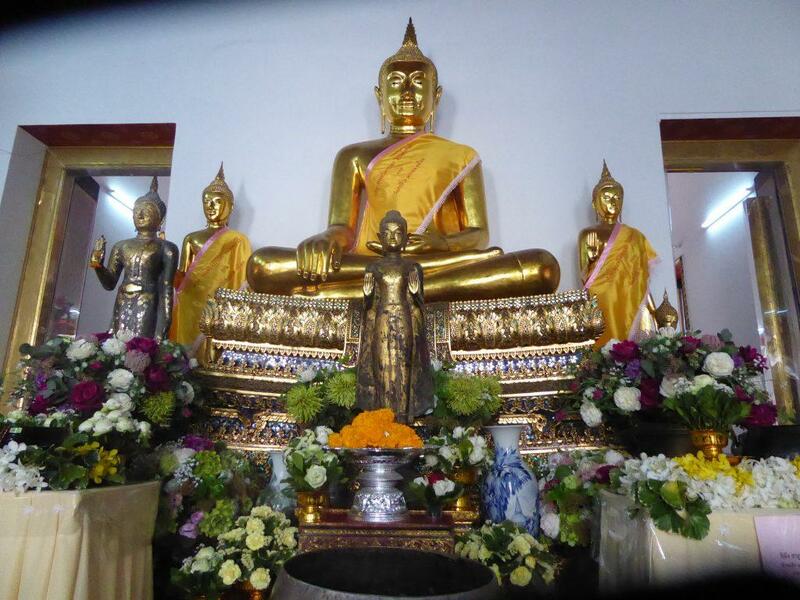 In the North Viharn is Phra Buddha Palilai made during the reign of Rama I. The image is of Lord Buddha sitting on a rock in a gesture of accepting offerings. Before him, are an elephant & a monkey offering him water & a beehive. 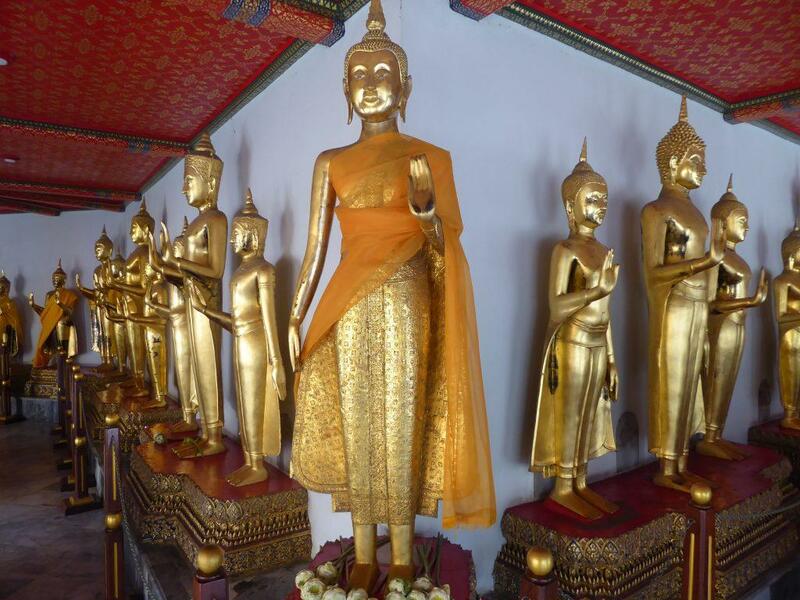 There are other Buddha images in the Phra Vihara Kod also known as the gallery which consists of four L shaped buildings in the four corners surrounding the Ordination Hall. Other Buddha’s can be found in Sala Karnparien which is a study hall for Dhamma practice as well as for merit making and sermons. The temple grounds contain 91 small chedis and 4 large ones. 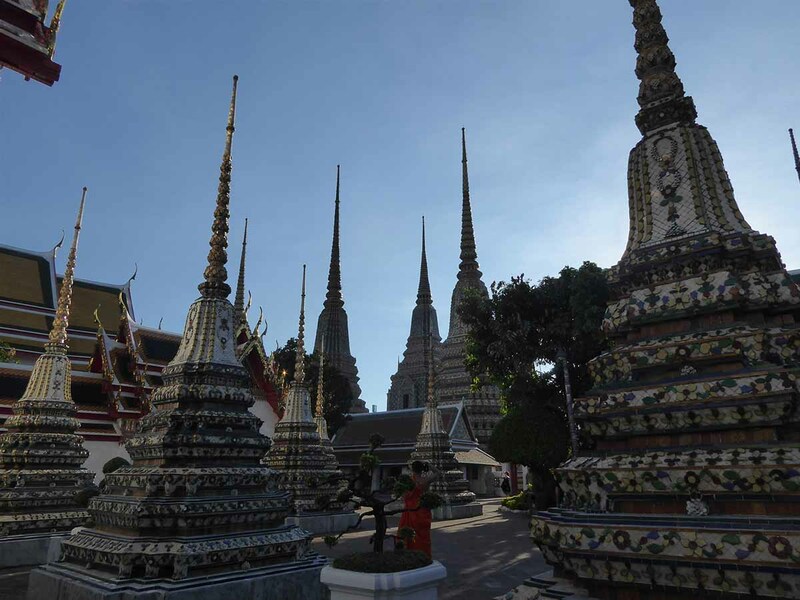 The group of four large Chedis is known as Phra Maha Chedi Si Rajakarn and enclosed within a white wall. There are four gates each guarded by two stone guardian statues, covered in mosaic tiles each a different color and each 42 meters high. 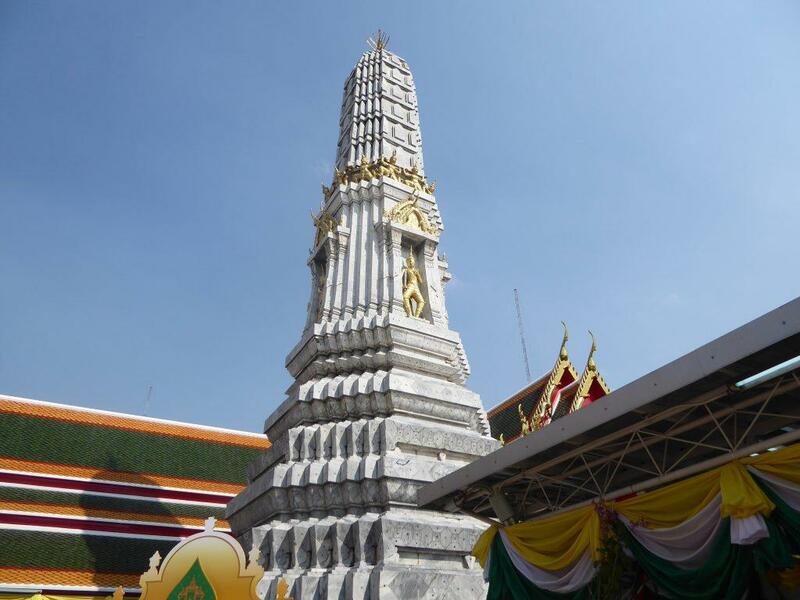 The green chedi is Phra Sri Sanpetdayarn, built during the reign of King Rama I. The Buddha’s relics are within. The white Chedi is Dilok Dhammakaroknitarn. King Rama III built it and dedicated it to his father King Rama II. The yellow chedi, Phra Chedi Muni Batborickharn was built by King Rama III and dedicated to the Buddha. Lastly, the blue chedi is Song Phra Srisuriyothai and built by King Rama IV. The Phra Maha Stupa are four stupas in the corners of the courtyard containing the Ordination Hall. 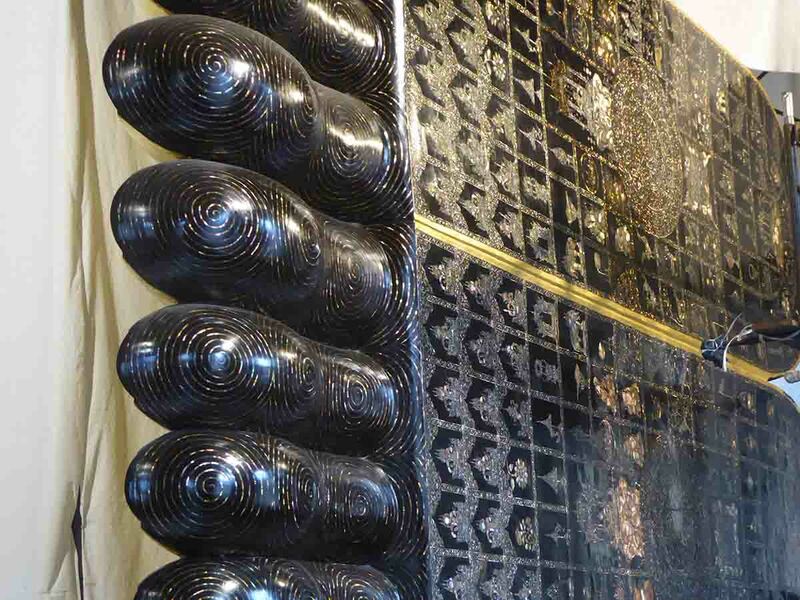 Each tiled with marble with four Khmer style statues representing the guardians of the four cardinal points, tin gilded with gold leaves and decorated with glass inlay. In front of the gallery are four groups of five stupas. Each group consists of a large stupa in the middle surrounded by four small stupas on the same base. 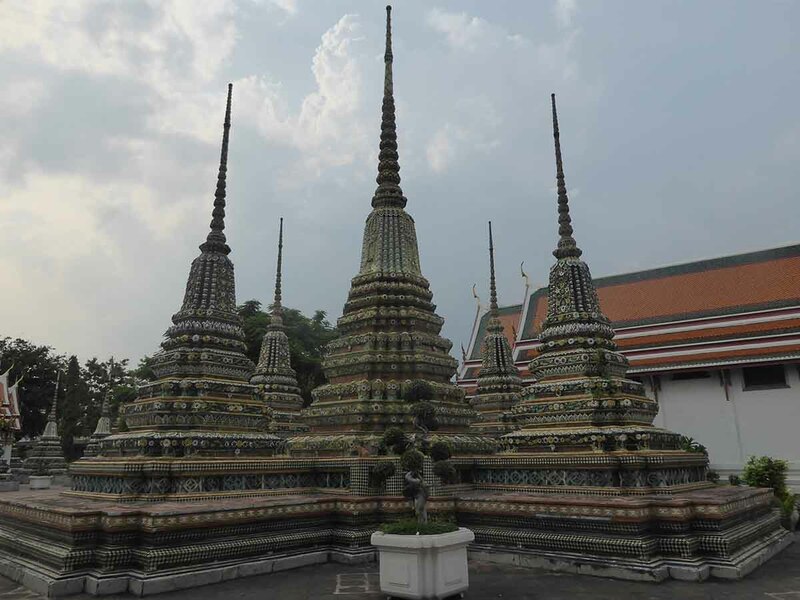 A group of 71 small stupas, Phra Chedi Rai, built during the reign of King Rama III surround the outside cloisters. 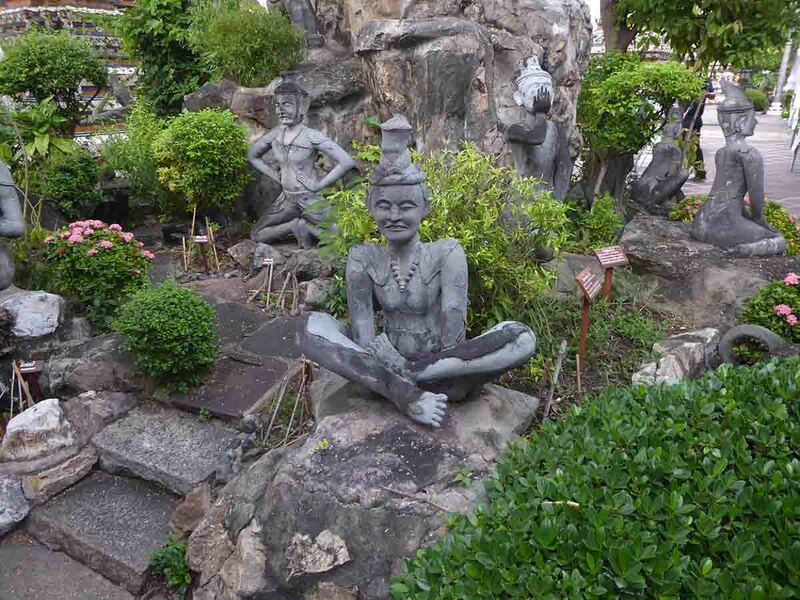 The temple grounds contain small rock gardens known as Khao Mor that contain statues that show the methods and positions of massage and yoga. The temple grounds contain 24 Khao Mor. 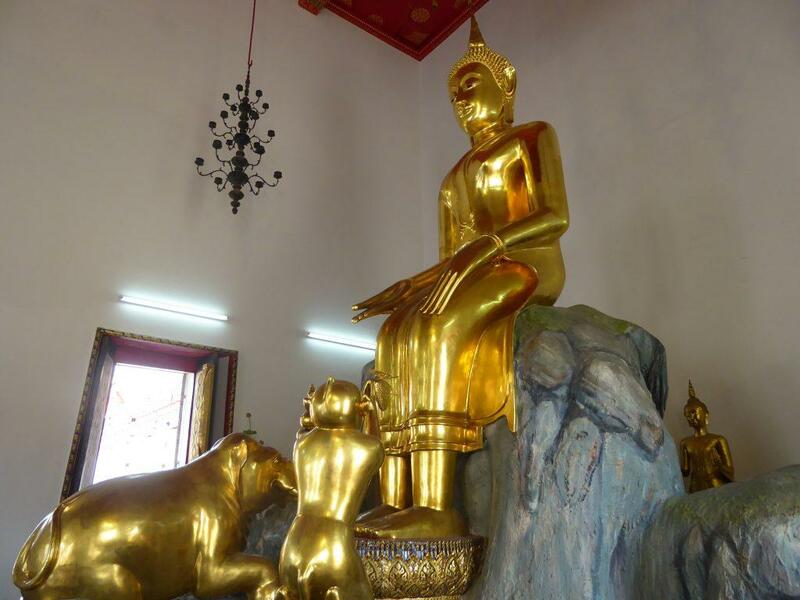 One of the Khao Mor contains a statue of the Lord Buddha’s Hermit doctor. Also around the grounds are plaques describing the rules of traditional medicine and the different illnesses that can be cured by massage. 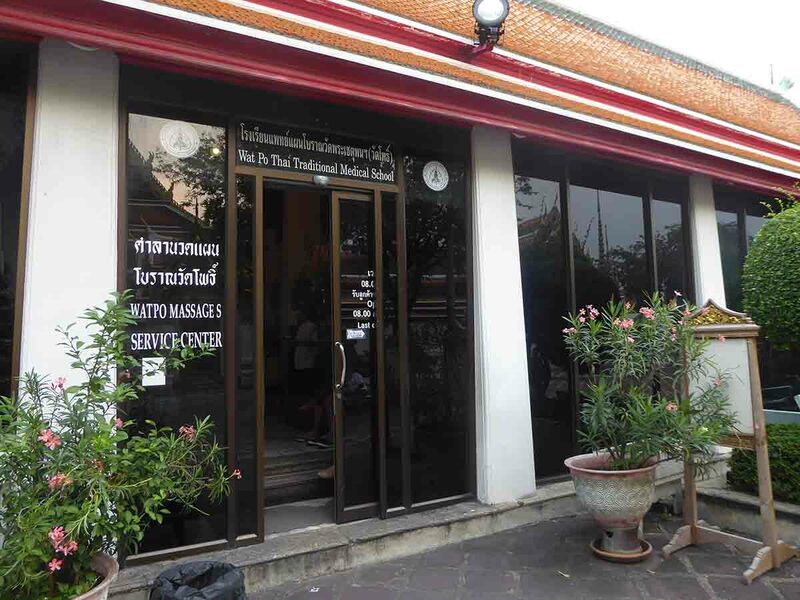 At the eastern edge of Wat Pho is a Thai massage school teaching traditional massage. Foreigners are welcome to enroll and learn the art of Thai and herbal massage. Visitors can also get massage treatment here. Thai massage and foot massage in 30-minute or 1-hour sessions ranging in price from 260 to 620 baht depending on time and oils/herbs used. Opening hours are 08.00 – 19.00. Elsewhere in the temple, you will see lots of statues. 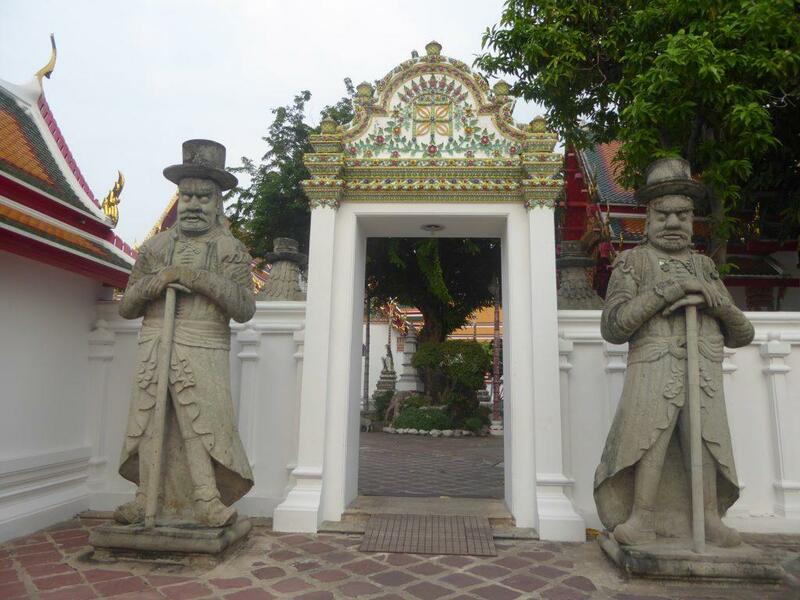 The giant gate guardians are Chinese and brought to Thailand as ballast for ships during the reign of King Rama III. The statues are in various sizes & types based on Chinese beliefs. There are monks, warriors, travelers, noblemen, and gods as well as animals such as lions, tigers, horses & pigs. 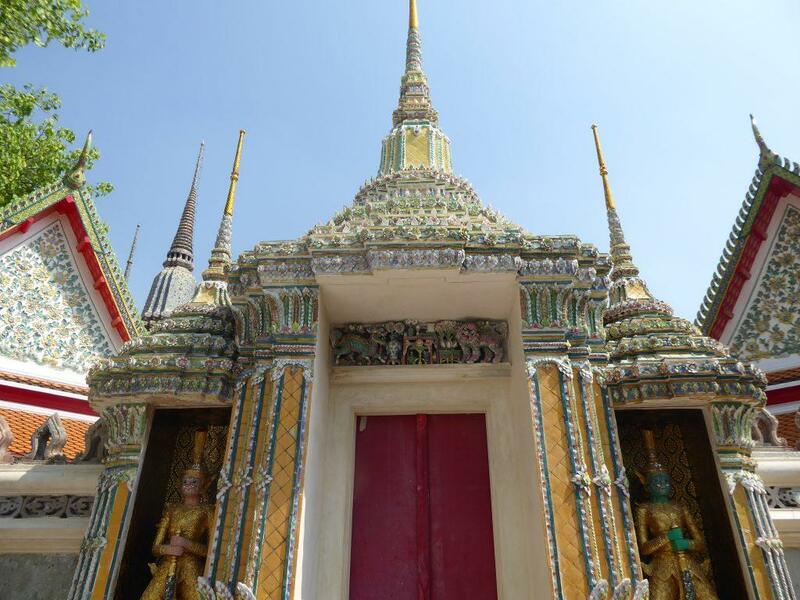 Guided tours of Wat Pho are available in English for between 200 – 400 baht. These are only available inside the temple. People who approach you outside the temple are unofficial. 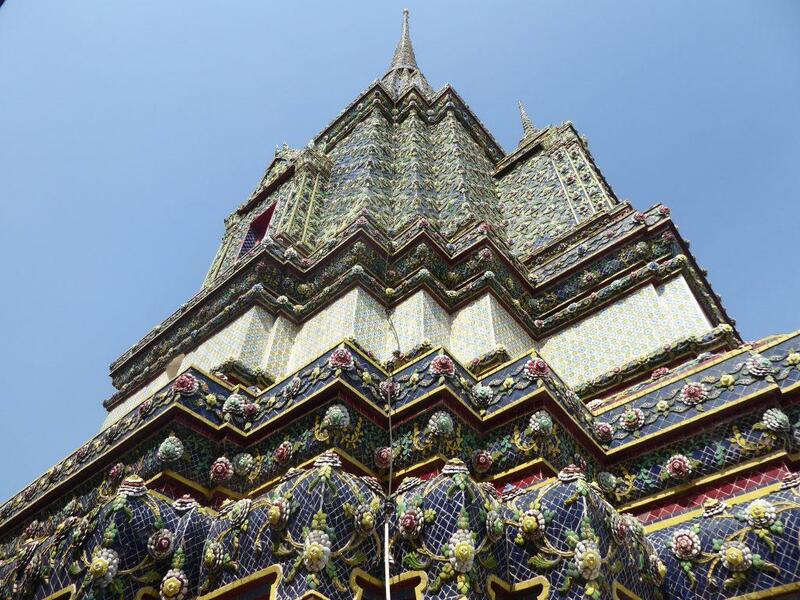 Watch out for con men in the area around Wat Pho. They will approach you and ask you where do you come from, where are you going etc. Their aim is to get you to follow them to a gem store or tailors. Location: 2 Sanam Chai Road, Phra Borom Maha Ratchawong. Rules: No shorts, short skirts or sleeveless tops.